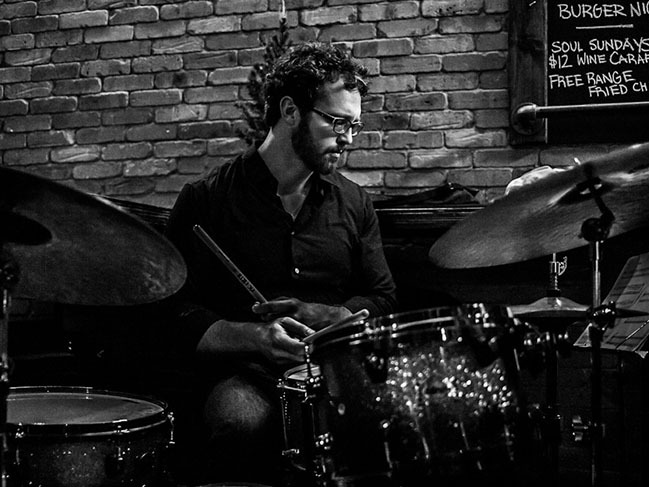 Percussionist and composer Jeff Davis has been one of the most active drummers on New York’s creative music over the past decade. Originally from Greeley, Colorado, Davis began playing marimba at the age of nine and later studied classical percussion at the University of Northern Colorado. While in Colorado, Jeff had the opportunity to study and perform with ECM recording artist/pianist Art Lande and trumpeter Ron Miles. Davis holds a Master’s degree from the Manhattan School of Music. Davis has been performing regularly in New York City since 2002. Early work as a sideperson in a number of active bands got Davis greater exposure. These bands included the Amanda Monaco 4, Eivind Opsvik’s Overseas, Kris Davis Quartet, the Peter Van Huffel Quintet, and Tony Malaby’s Tone Collector. He founded his group We Sleep Outside in 2006 (with Kirk Knuffke, Tony Barba, Jonathan Goldberger, Kris Davis, and Eivind Opsvik), and has since formed a great number of groups, including the Jeff Davis Band, in 2009, which has fluctuated in membership, and the Jeff Davis New Trio, with Russ Lossing (piano) and Eivind Opsvik (bass), in 2010. Davis has played in a number of different groups, including the Jesse Stacken Trio, Michael Bates Outside Sources, Kirk Knuffke Quartet, Landon Knoblock Trio/Quartet, Ben Holmes Quartet, Pascal Niggenkemper ‘Newfield’ Trio, Pedro Giruado Jazz Orchestra, Pete Robbins’ Unnamed Quartet, Jon Irabagon’s Outright!, the RIDD Quartet, and the Ryan Keberle Organ Group. In addition to these working bands, Davis has also performed with such artists as Tony Malaby, Chris Speed, Gebhard Ullmann, Brad Shepik, Ralph Alessi, and Ron Horton. Davis has toured Europe and China and has performed at several prominent jazz festivals, including the North Sea Jazz Festival, Oslo Jazz Festival, the Vancouver Jazz Festival, and the Earshot Jazz Festival.